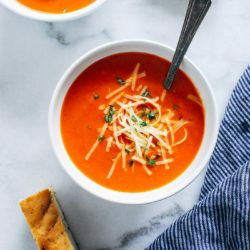 15-Minute Tomato Soup- this easy tomato soup is perfect for when you have a last minute craving. 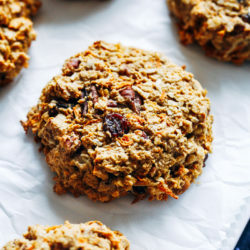 Made with just 8 simple ingredients, you probably have everything you need in your pantry to make it! 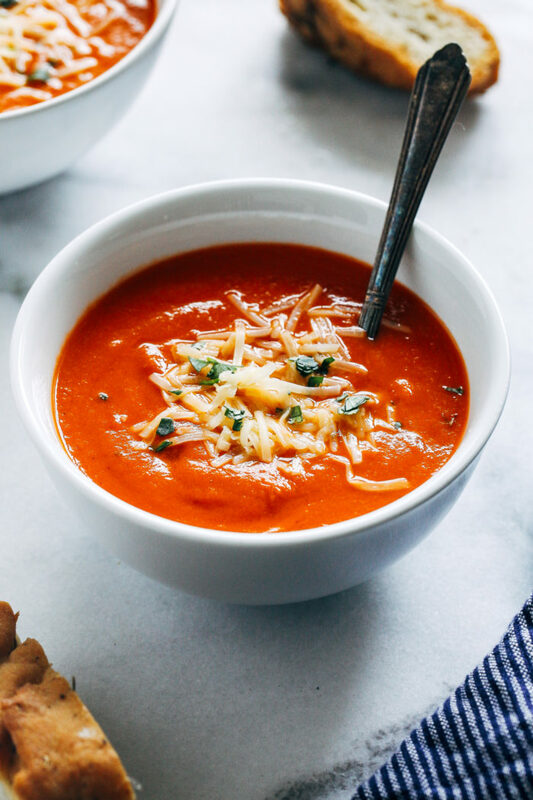 Late last summer I posted a recipe for this Roasted Heirloom Tomato Soup and I received a ton of questions on how to make it with canned tomatoes. 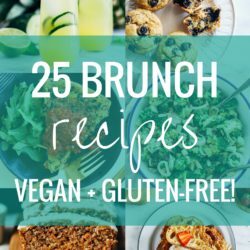 While that recipe is specific to fresh tomatoes (can’t wait for those juicy beauties to come back in season), I thought I would create a recipe for you guys using good ol’ canned tomatoes. 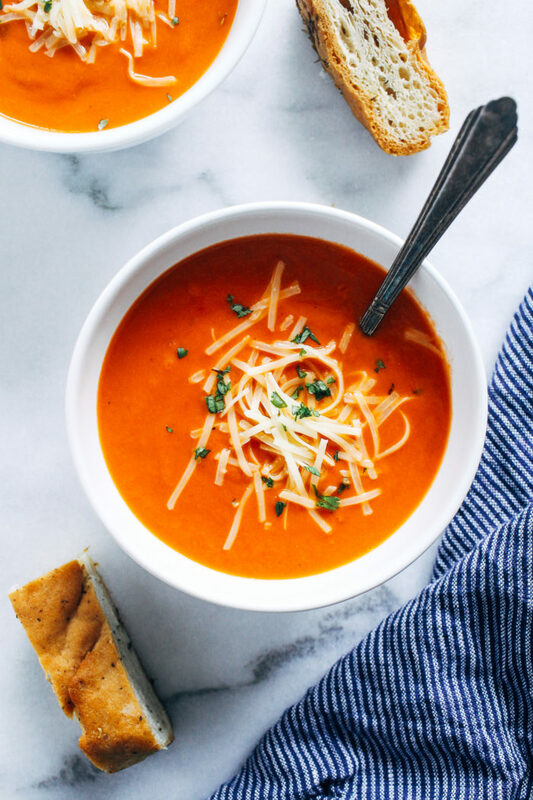 Because it’s winter and there’s no better time to whip up tomato soup with grilled cheese. Yum. Truth be told I’m partial to the version using fresh tomatoes because it’s just so dang good but I have to admit, this version is way easier. Hence the fact that it takes all of 15-minutes to make. 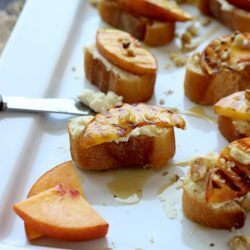 Vegan Butter or Oil: I love to use Miyoko’s vegan butter as the base for this recipe because it gives it that delicious buttery flavor. But olive or avocado oil also works great here if you’re not into butter. You could also use a splash of broth if you’re avoiding oil. Onion and Garlic: These two create the base of our soup, adding just the right amount of savory flavor. Feel free to add more garlic if you like. Canned Tomatoes: I say canned tomatoes because I assume that’s what most of you buy or have on hand. That said, I personally prefer jarred tomatoes. Sure there are some companies that claim their cans are BPA-free, but it’s likely whatever they’re using in place of BPA ain’t so great either. 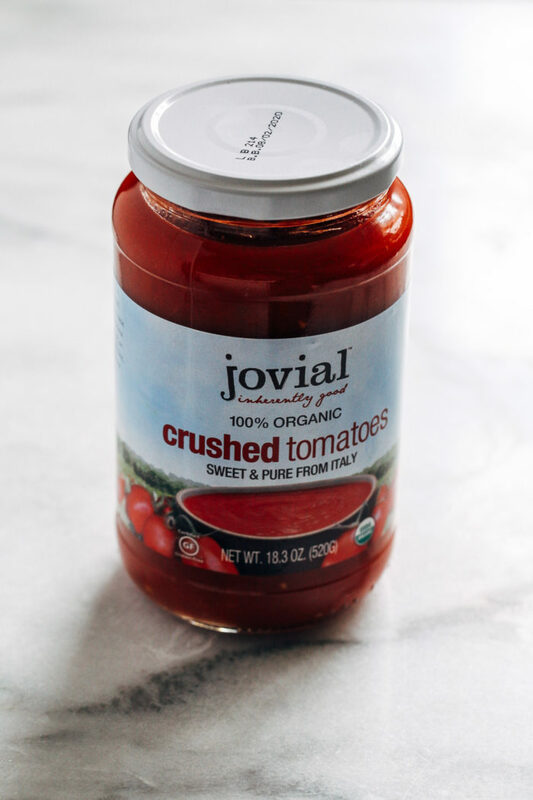 Jarred tomatoes are a much safer bet and Jovial is my go-to brand. Diced or crushed tomatoes will suffice. It just depends if you like chunks of tomatoes in your soup or not. Dried Basil and Sea Salt: Just a touch of seasoning gives a hint of herby flavor. I like to used basil but oregano would also work great here. White Beans: I like to consider this a secret ingredient since you would never know there are beans in it when you taste it! We are using these mainly for texture and to give the soup a boost of protein and fiber. When I’m out of white beans I’ll use garbanzo beans and they work just the same. Sauté the onion and garlic. After you finely chop the garlic and onion, warm the butter in a large pot over medium heat. Cook the onion for a few minutes then add the garlic and cook until fragrant. Pour in half of the tomatoes. This first half gets blended for a smooth consistency while the other half is added at the end for texture. Add the seasonings and broth. Allow to seasonings to cook with the tomatoes and broth for a just a few minutes. Blend it up with the beans. 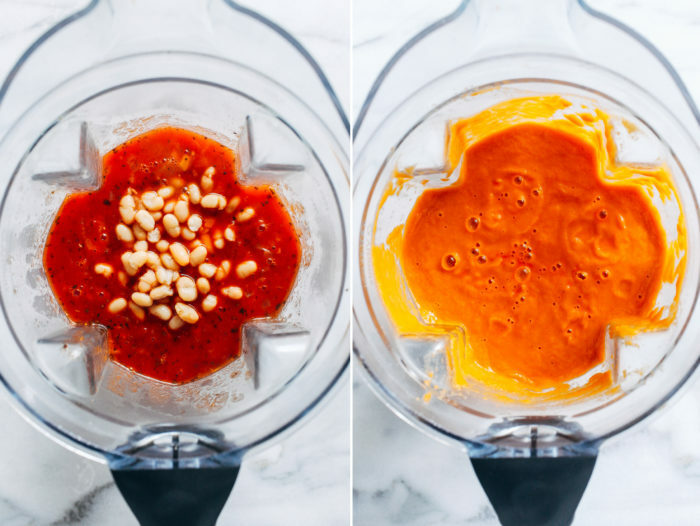 Transfer the tomato soup to a blender with the beans and blend until smooth. The beans help thicken the soup, giving it a richer texture. Feel free to use just 1/2 cup if you want a lighter texture. Pour back into the pot with the remaining tomatoes. Adding the remaining tomatoes at the end preserves some of the tomato texture. 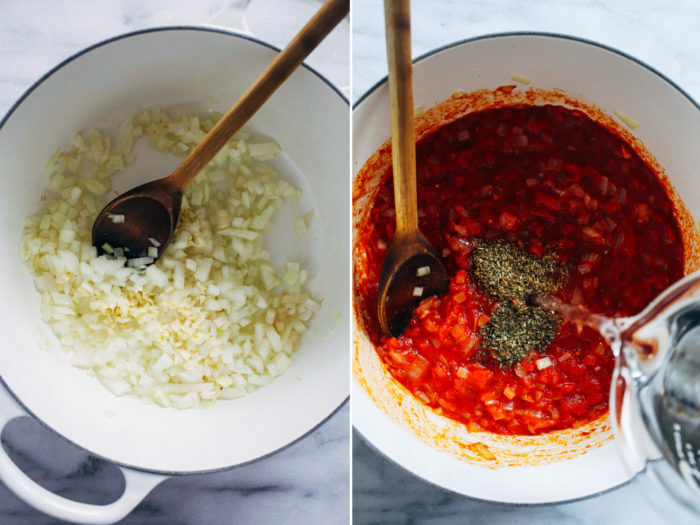 This will vary depending on whether you used crushed or diced tomatoes. You can also blend all of it if you like a super smooth tomato soup. Serve warm and enjoy! Along side a crusty piece of bread or grilled cheese, and a salad for good measure. 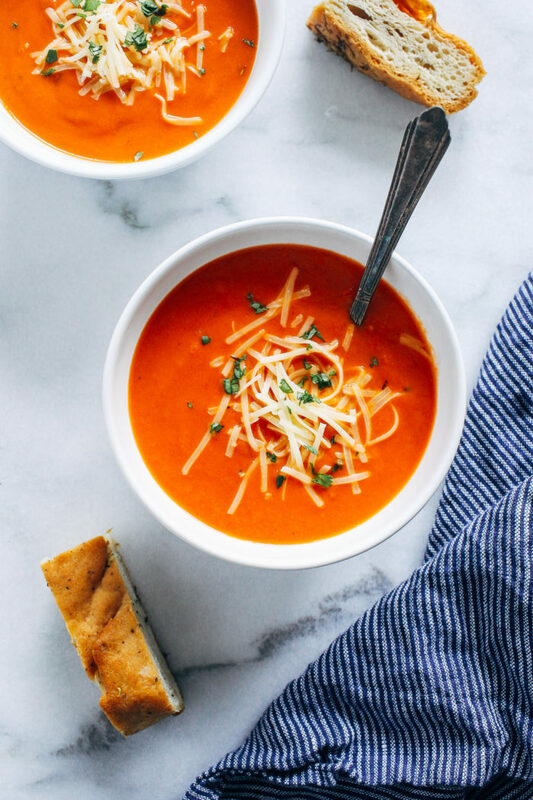 This easy tomato soup is perfect for when you have a last minute craving. 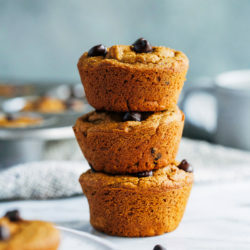 Made with just 8 simple ingredients, you probably have everything you need in your pantry to make it! In a large pot, warm the butter over medium heat. Add the onion and cook until translucent. Add the garlic and cook for about 1 minute. Pour in half of the tomatoes, basil, salt and broth. Bring to a low boil and cook for 5 minutes. Remove from heat then transfer to a blender. Add the drained and rinsed beans and blend until smooth. Pour back into the pot along with the remaining diced tomatoes. Bring to a low boil and cook until heated through. Serve warm and enjoy! I like to used diced tomatoes for more texture but crushed tomatoes will also work fine! Oooh yea, I love making easy tomato soup. It’s always been one of my favorites. I love the addition of beans here too! Oooh yea, I love making easy tomato soup. It’s always been one of my favorites! Love your addition of beans in here. I’m always up for adding beans into recipes! Oh my, I’m going to have to try this over the weekend. Not really cold here, but will be rainy. 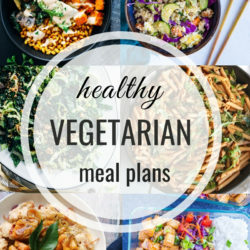 I’m with you – I much prefer fresh tomatoes but this is perfect to have on hand for last minute meals! 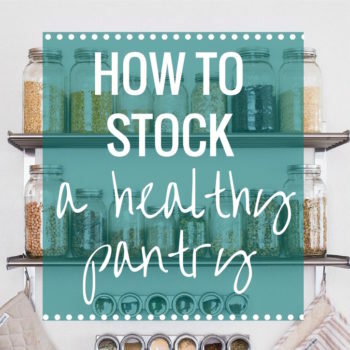 I love that it’s all pantry staples! I made this and it was delicious! Love how quick and easy it is. This might be a silly question, but what kind of what white beans did you use?